Female Catechists’ Formation Centre, Kwall, has graduated eight more female Catechists. The ceremony was witnessed by Bishop Charles Hammawa of Jalingo, Bishop Bulus Yohanna of Kontagora Vicariate, Bishop Michael Gokum of Pankshin Diocese and the chief host, Archbishop Ignatius Kaigama, with families, friends and well-wishers in large numbers. The Centre, which was official opened as on the 27th February 2013 and graduated the first twenty female Catechists last year, has again graduated eight female Catechists from Jos and Kontagora Vicariate. The ceremony took place on May 31, 2016. The Bishop called on the graduants to be vessels of God’s mercy and forgiveness especially in this Year of Mercy and to preach the gospel in season and out of season. He urged them to draw strength from St. Peter’s faith in Jesus to do what common sense will call foolishness, especially in the face of difficult situations. 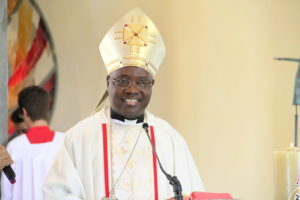 Commissioning the new female Catechists, Archbishop Kaigama commended their heroic sacrifice by being fully involved in the work of evangelization. The Prelate stated that he established the Female Catechists’ Formation Centre because of the immense pastoral needs of women whom he met in large numbers during his pastoral visits to parishes. He praised the graduands for availing themselves of this opportunity and challenged them to bring the gospel message to every part of their lives and the world at large. In her remarks, Director of the Centre, Sr. Faustina Jimoh OP thanked all present and appreciated their love and support. She admonished the new female Catechists to be true ambassadors of Christ and of the Centre and be faithful in prayers, saying the task ahead of them is a tremendous one. Responding, president of the graduating catechists applauded the Archbishop whom God had inspired to establish the Centre and for the opportunity given to them to be trained as catechists. She also thanked everyone who touched their lives, and their families who stood by them.